As with any skill there are mistakes you can make, and detours you can head down, when you're first trying to improve socially. This article will cover some of the big ones I've noticed people doing over the years. Hopefully by bringing them to your attention it will save you a bit of time. Most people aren't incredibly charismatic. They're contentedly average. In fact, many of them have their share of awkward and insecure moments, but they still have social lives they're happy with. If you're unsatisfied with where you stand, realize you don't need to get your social skills up to a world class level. You don't need to feel discouraged because you think the road will be long and difficult, or put too much pressure on yourself to be the best of the best. You really only have to get barely past the point where your skill level is keeping you from getting what you want. It doesn't take too, too much to get to a point where you're reasonably confident, can keep a conversation going, and know how to make new friends. Some beginners have a related belief that they won't be worth anything as a person until they're really magnetic and popular. That's one of many common counterproductive motivations for changing. Western society often portrays the typical socially successful person as a chatty, bubbly type who's in their element during noisy, hectic group events like parties. It's easy to conclude you have to become one of them to change your own social life. Some beginners who believe this do so unquestionably, even eagerly. Others feel more begrudging about changing, but still think they have no choice but to get with the program. Either way, they may waste a lot of time trying to force themselves into that mold (e.g., making themselves go to lots of nightclubs). The truth is you can have a rewarding social life while also being more reserved, enjoying your alone time, not having a ton of friends, and preferring quiet outings with only one or two other people. Sure, you can't be reserved and solitary to the point where you never talk to anyone, but if you're just a bit on the non-chatty or self-contained side, that won't hold you back as long as you start friendships with people who understand your style. Parties, clubbing, and having a million friends can be fun if that's your thing, but there's no higher law that says being good at them is the peak of social achievement. Of course, it's okay if you truly want to be more outgoing, or get better at working a room, but you don't have to pursue those things. Beginners often ask for scripts and examples, for things like starting conversations or inviting someone to hang out . There's nothing wrong with that. A few good examples can give you a rough idea of how an interaction could go. However, focusing on them too much, and feeling you need one for every situation, can slow your progress. Conversations are complicated and easily go in unexpected directions. And even if it was possible to plan every exchange ahead of time it would be too hard to memorize everything. Scripts can get you started, help you with very short, specific types of exchanges, or give you a few fallback options during a lull, but to get better at conversations long term you need to learn to improvise using more general principles and skills. That can be frustrating to hear as a beginner, to feel like you're being told to just jump in and blindly figure things out. You can still give yourself some structure when you practice thinking on your feet. For example, you could go to a get together and plan to try out the general approach of, "Ask people about their interests and hobbies, then listen as they talk about them." On another night you might work on sharing things about yourself. It's not uncommon for beginners to worry that if they don't phrase things in the exact right way that they'll come across as inappropriate or desperate. For example, if they want to ask a classmate to hang out they may spend hours overthinking one text, or even post their invite message on a social skills forum to ask if it's okay. If you're really unfamiliar with something like making invitations it's fine to double-check the first few times to make sure you aren't totally off base, but after that you should try to trust your instincts and realize your phrasing is probably fine. They asked while they were chatting with the co-worker over lunch. The two have had several pleasant conversations since one of them started at the office a month ago. The inviter doesn't know it, but the co-worker loves coffee. The co-worker just moved to town and is looking for new friends. The person asked while standing too close to the co-worker and staring intensely into their eyes. They asked while the co-worker was about to head into a stressful meeting. The two have barely talked to each other, aside from one time they got into a petty argument in the photocopier room. The co-worker is busy with their family and has no time for new friends. People can feel off balance in social situations because they don't know what's expected of them. They feel like they missed learning all the unsaid social norms everyone just seems to know. They wonder if there's a handy list of every social rule they could read to get up to speed. As this article explains, there's no such list. You can look up some of the more basic expectations, but overall the social world is too complex, varied, and constantly changing for everything to be written down somewhere. You need to put yourself out there and learn to piece together the social rules for a particular situation for yourself. The logic here seems sensible. You want to get better at making conversation and meeting people, but you feel too nervous and insecure to practice those skills. Well if your anxiety and lack of confidence are in the way, then you should put the other things aside and deal with that problem first, right? If you hardly have any knowledge of how to deal with anxiety and self-doubts there is value in getting familiar with the the topic. What doesn't work is trying to fix all your confidence issues before you get back to anything else. Why? Because you can only do so much to repair your confidence and courage by sitting around at home and analyzing yourself. The rest of your progress will come from putting yourself in the situations that make you nervous and unsure, and gradually getting better at them. You can't erase your worries about being in conversations if you never talk to anyone. You need to build up that real-world experience that lets you tell yourself, "I can handle this. I can do this." As I explain in this article, some people have a social experience where they're mysteriously much more confident, sociable, and quick-witted than they normally are. Everything goes well, and they understandably start believing that to make progress they have to keep having that type of mental boost. Unfortunately, that feeling of firing on all cylinders appears unpredictably and is impossible to call up at will. Beginners can become too dependent on being in that right mood, and feel they can't put themselves out there if it hasn't struck them. The reality is your confidence and mental sharpness is partially out of your control. Some days you'll randomly find yourself in a good headspace. During others you'll feel off and unsure of yourself, no matter how much you try to make it go away. It's important to gently push yourself and learn firsthand that sometimes you'll be out, and you won't be in the best frame of mind, but that if you put yourself in the mix anyway you may still have a good time or learn something new. I have social anxiety and read that to get over it I have to face my fears and be around people a lot more. Well over the last few weeks I threw myself into every social situation I could and I'm more stressed out and anxious than ever. What gives? I thought this was the advice everyone recommends. Pushing your comfort zone can reduce your anxiety, but you have to do it in a systematic, gradual, controlled way. You start with what you can handle, then once you're used to that you move on to a next step that's just a little scarier. You set small realistic, achievable goals, and build on your successes. To get more comfortable with skiing or snowboarding you need to practice and put in some time on the slopes, but you'd never go to a big mountain, buy an all-access lift pass, and try to go down runs at random. Some would be far beyond your skill level and leave you injured and discouraged. You'd start on the beginner hills and work your way up. Also, a prerequisite to putting yourself in scary social situations is to know how to spot and diffuse the kinds distorted, self-sabotaging thoughts socially anxious people are prone to. Say someone is going to a party to try to push themselves to try to join some group conversations. Beforehand they may have counterproductive thoughts like, "If I can't talk to anyone it means I'm hopeless and should give up forever." If they get into an interaction they may be thinking, "Why am I even trying? I know everyone here thinks I'm boring." After they may tell themselves, "I only chatted to two groups. That's nothing. I'll never get the hang of this." Thinking like that can easily derail you if you don't know how to handle it. E.g., going out in public in an odd, attention-grabbing outfit, or walking around and asking people really strange, confusing questions. You can come across accounts of people who have done this. It also seems to be an approach people come up with on their own. The logic behind this also seems to make sense. If you're worried about rejection, why not get used to it in one fell swoop by inviting a huge amount of it? It does take some courage to get yourself shot down so aggressively, and it helps with a fear of rejection to a degree, but it has two problems: 1) When you're doing really outlandish things you know deep down it's a zany stunt, and that you're not putting the real you on the line. Messing around like this can even be fun. Some people actually have an easier time walking around being purposefully bizarre than they do going up to a stranger and straightforwardly introducing themselves. If you're going to push your comfort zone and face your fears it's better to do more low-key, realistic things (e.g., if you have a fear of looking nervous in front of people, ask a stranger for directions while purposely making your voice tremble; If you have a fear of being watched and judged, walk around in clothes that are slightly different and quirky, but still within the realm of what a person might actually wear). 2) A fear of rejection isn't something you can fix with one big, dramatic outing. You may feel more fear-free for a while, but it will wear off. Rejection is something you need to slowly become comfortable with over a longer time. When some people learn about the concept of practicing their social skills their first instinct is to go to a busy public place like a mall and try to start conversations with random shoppers. Talking to strangers isn't the best way to work on your conversation skills. Most people would be better off finding a more regular social activity to get involved with (e.g., a volunteer position, a weekly games night at the local hobby store, a casual sports league, improv comedy classes). If you want more pure one-off practice sessions, attending lots of meet ups is good way to go. If you go to a social event like a party or meet up you've got an implicit invitation to approach people, and the conversations can last a while. When you're a member of a club or team you can get to know people over several months. Talking to strangers doesn't have these advantages. To start, you often to have to interrupt people who are going about their day, and aren't necessarily in a social frame of mind. You may have no reason to speak to them, other than you want to practice, and have to invent excuses to begin the conversation. Approaching people like this can be hard on the nerves. Once you start talking, they may happily chat to you, or they may have a "Why is this person speaking to me? I'm just waiting for the bus" wariness (this is especially true in more private, reserved cultures). If you do end up chatting, the interaction is likely to be superficial and over quickly. The fact is most of the socializing people do isn't with randoms out in public. They're either talking to people they're familiar with, or if they are meeting strangers, it's in a context focused around that, like a party, networking event, or nightclub. This isn't to say chatting to strangers is always useless. For one, the fact that it can be scary means it's a good way to push your comfort zone if you're trying to whittle away your social anxiety. If you're specifically trying to get better at making quick small talk, strangers are as good to practice on as anyone. Overall though, realize there are better ways to get experience with people. This is similar to the point above. When some people learn they can actively try to make new friends, the first thing they think to do is go to a bar or nightclub and try to chat to and befriend the other patrons. It's that same instinct to think the solution lies in talking to strangers. The approach can work - people do start chatting in bars, hit it off, and agree to meet later - but there are easier ways to meet friends, like through a part-time job or a hobby club. Misapplying advice to "take an interest in others" and "be a good listener"
Focusing on the other person is a fundamental conversation skill. Some beginners mistakenly take the concept too far. They ask about the other person and listen to their replies, but don't share a single thing about themselves. They think that bringing up any of their own opinions or experiences would make them seem like they're self-centered or trying too hard. Even if the conversation is mostly centered around the other person, you still need to talk about yourself every so often. If you don't two things commonly go wrong: 1) They get irked because they wanted a back-and-forth conversation, not to be interviewed by a non-entity; 2) They happily answer your questions and go on about themselves or their hobbies, but never ask about you. They chat for a while then go on their way. The promised pay off - that if you're interested in people, they'll think you're interesting and want to be friends - never comes. By being a blank slate you unintentionally sent the message of, "I have no personality of my own. I'm happy to act as your listening robot." Being able to tell entertaining longer stories is a useful skill, but I think its importance is overstated sometimes. Some people pick up the idea that being a good storyteller is the one key to being fun and interesting. Realistically, the skill is nice to know, but it's not a high-priority, make-or-break part of socializing. It doesn't come up that much. Some very likable people hardly ever share stories. In most conversations it's more important to know how to have a flowing back-and-forth exchange. By all means, work on your ability to share a witty tale, but don't devote so much time or worry to it that it distracts you from other skills. 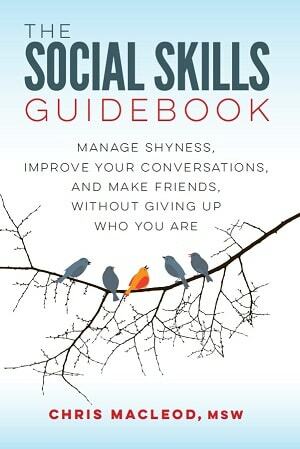 There are other reasons people can sidetracked by this, but a big one I'm thinking of is that Influence by Robert Cialdini pops up on many lists of social skills resources. It's a good book for what it covers, but its prominence can create the perception that influence and persuasion are a core part of day-to-day social skills. A familiarity with persuasion techniques is hardly bad to have, and obviously it's useful if you have a job that involves sales or negotiating. However, in most friendly, typical social interactions many other skills are more important to getting along with people, like knowing how to manage your nerves and insecurities, think of things to say, be a good listener, organize plans, and so on. It's only here and there that you need to use the odd bit of persuasion knowledge, like if you want to deal with an unreasonable request, or mildly cajole a friend to see one movie over another. If you really go overboard with the persuasion focus you can even come across as creepy and manipulative. Focusing on the psychology of influence can also play into two related misconceptions. 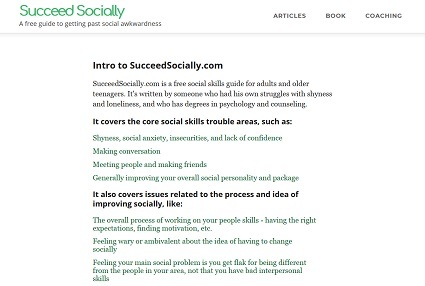 The first is the belief that having "good" social skills means being a kind of puppet master. Having solid people skills is really more about being polished in basics like confidence, conversation ability, friendliness, and empathy. Charisma does give you a certain amount of sway over others, but that's mostly because if you're genuinely likable people will be happy to go along with you, not because you know how to play them like a fiddle. The second misconception is that most people have bad intentions, and everyone is constantly trying to manipulate you, so it's essential to know how to fight fire with fire. That's an inaccurate, cynical view of the world. There are environments or circumstances where you need to be on guard, but for the most part people are friendly and aren't out to get you. Men are more susceptible to this one. There's advice that says that to do well at socializing you need to be dominant in any group or interaction, and not let yourself get pushed around or be low on the totem pole. Overall this flavor of advice portrays a world where only the strong survive, and everyone's constantly jostling for position, and using subtle and not-so-subtle tactics to try to lower their rivals' status. Social hierarchies and dominance are a part of life, and it wouldn't hurt to learn how to deal with people who try to put you down, but it's a mistake to focus on that stuff too much. It can turn you into a paranoid, unpleasant individual who sees every person as competition, every conversation as a battle, and every remark as a covert attack. The fact is unless you're in a really cutthroat environment, most of the time when someone's interacting with you they're good-natured and are just looking for someone pleasant and fun to chat with. They're not secretly plotting how they can step over you. In the same vein, not every group is host to an under-the-surface war to be the pack leader. In many social circles everyone sees each other as being on more-or-less equal footing. They're friends who like and want the best for each other, and have literally never given a second's thought to their "rank".